You will love the large open floor plan of this gorgeous 6500 Sq Ft. luxury, newly constructed home in Annapolis with 6 bedrooms. The open floor plan of the first floor is comfortable for large groups, with living room, dining room, luxury kitchen, eating area, sitting area, family room (with 20 foot ceiling) which open to one another and provide a comfortable space to relax and enjoy, ideal for a group. The first floor also has a den (with separate french doors), and a powder room. The kitchen has every imaginable chef's aid, as well as cutlery for 20, stemwear for 40, linens and large serving dishes. The 2nd floor has 4 bedrooms, with very large master bath, with jacuzzi tub and separate double shower. The lower level is well appointed with clubroom with pool table, ping-pong, air-hockey table, custom built-in bar, surround sound, flat screen, playroom/day room, gym with treadmill and weights, and 800 square foot suite. The house can accomodate 15 in beds and another 4 comfortably. Enjoy surround sound throughout, outdoor speakers, 6 flat screens, wireless internet. Feel like you have arrived at a W Style hotel when you enjoy the outdoor patio with couches, and eating tables for 12. The outdoor fireplace enhances the experience along with 2 outdoor heaters and gas grill. You will enjoy and relax in this well appointed home that is comfortable for all including children! Bedrooms include Master bedroom- Bedroom 1- with master bath and king size bed. Raven's Room- Bedroom 2: Bunk beds- single over full bed, with entrance to full 'Jack-n-Jill bathroom (adjoining Pink room), 'Pink Room'- Bedroom 3 Queen adjoining to Jack-n-Jill Bath, 'W Hotel'- Bedroom 4 Queen with private full bath. 'Lower Suite'- Bedroom 5 below level, private full upscale bath with Queen & Futon Bed. (This suite has a separate entrance for shared bathroom with club room and Safari Room). 'Safari Room'- Bedroom 6- with full bed and twin trundle. 500 threat count sheets and luxury full towels provided. Beautiful newly installed patio with couch that seats 8 comfortably and two dining tables for 12. Horseshoes, Corn Hole, Bocci Ball. Lacrosse bounce back, and toys included. Boating, tennis, historic Annapolis nearby. Two off street spaces and plenty of FREE STREET PARKING available in this Annapolis community of Kingsport. Go Navy Beat Army! We are a family of 6 living in Annapolis, we love Navy and have a long Navy lineage. we are quick to respond, answer questions, or resolve any problems which could arise. Our goal is to make you have a wonderful, relaxing vacation with a feel of luxury and comfort. Annapolis is a beautiful city, with exceptional activities within the Chesapeake Bay region. We pride ourselves on creating a beautiful space that will wrap you in warmth, comfort and possibilities. Our property is clean, organized, and makes for a great experience with a large group. Whether is table setting for 25 guests, access to 12 platters, 12 serving bowls, pitchers, linens, grilling cutlery, propane, patio heaters, extra towels, blankets, pillows- all of these things are provided for you in abundance. You are our supreme guests and you will feel that way when you are here! Plenty of free parking! Our large home includes premium 500 threat count sheets, beautiful full size fluffy towels, spa like amenities in each bathroom, full sets of dishes, glasswear and everything you need to entertain. Our basement is premium construction with 1800 sq ft of separate living space, with surround sound, bar, fridge and gym. We are committed to comfort and treat our renters as our personal guests. We have both a traditional coffee maker and individual coffee dispenser. Kitchen has all items needed for cooking. The house was beautiful and the owners were very accommodating. Centrally located in a beautiful community. Very peaceful. We really enjoyed our stay and would highly recommend this property and owner to anyone considering the area to visit. Well kept, very clean and large area for our group to gather and talk. Our group of friends had such a great stay, they want to visit again in two years! Perfect for our family to enjoy the holiday. Owners were fantastic and very responsive. The house had all the amenities of home and was very comfortable. It exceeded our expectations. We would DEFINITELY stay again. 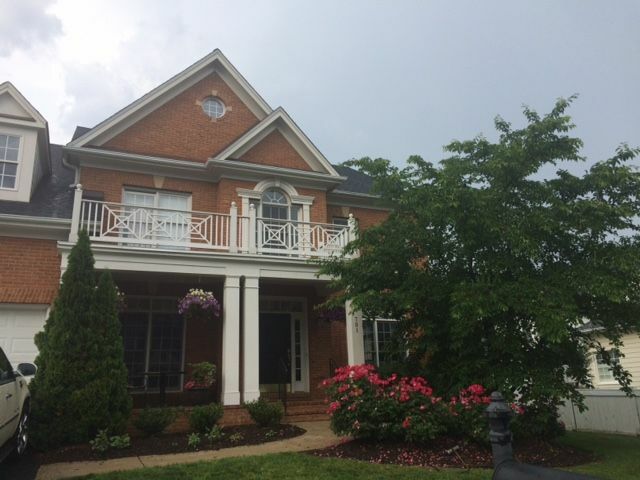 This is a large, relatively new home in a neighborhood of large homes (that are close together) near the South River just 3 miles from downtown. The home is beautiful & is artfully decorated and it's VERY clean. We (16 people, from a far-flung family, most of whom grew up in Annapolis) rented it on short notice for a sad occasion, a family funeral. It was a wonderful place for us to be together at such a time -- and besides that it was a bargain compared to hotels. The photos are 100% real. It has a relatively large and fenced-in back yard, with a big gas grill, fireplace, outdoor seating, outdoor heating, etc. It has a bazillion games to play and more TVs than I bothered to count. The owners rushed to get it ready for us, and they're willing to work with you on arrival time, etc. They were wonderful with that, and it was perfect for our purposes. Just fyi, this would be a ROTTEN place for a frat-party-style blowout, because the home is in a family neighborhood, with many small children around. I reckon the neighbors would call the cops real quick regarding high-jinks like that. I'd recommend it highly for any family contemplating a low-key gathering, whether that's an occasion like ours or Commissioning Week, or the boat shows, etc. This house was perfect for a college reunion of six families - 10 adults and 5 children (ages 5-8). It was was clean and spacious, with plenty of room for everyone to relax. The patio seating area in the fenced backyard gave a nice secluded feeling. And the basement area was a huge hit with the kids. Most importantly, the location was great! It was an easy commute to outdoor activities (kayaking), the metro station to DC, an awesome mall, the Annapolis harbor (including the Naval Academy), and tons of bars and restaurants. The one unanticipated aspect of this house was that it's not what we consider a traditional rental property, but rather the family's main residence. As such, there are a number of personal things around (pictures on walls, stocked pantry, etc.). While we didn't anticipate this, it did not impact us. The house has a wonderful, comfortable feel and is an easy place to relax. The owner was very responsive to questions both before and after the booking. A few weeks before we arrived the owner did contact us to let us know that the development pool was no longer available to renters. This was a little disappointing since it was VERY hot when we were there, but this is not a deal breaker. It's a great house and we would definitely rent again! The home was beautiful and the owners were very helpful. We spent the weekend with our kids and grandkids and everyone had a great time. The house had a pool table, ping pong table, air hockey, dart board and outside grill, corn hole boards, and lots of kids toys and games. The TVs had all the premium channels and there were drawers of DVDs to watch movies. The beds were comfortable and the home was set out well. The only negatives - there was no cell phone reception for calls on AT&T in the house (there is WIFI) and there were HOA restrictions on the use of the pool and hours to grill and use the backyard. I highly recommend this beautiful house for your stay. We stayed in this property for a student organization retreat and it was a good space for that purpose. The house was plenty big enough for our large group of 15 adults, plus it was beautiful and clean. The students enjoyed the spacious house and the comfortable patio. Additionally, the owner was friendly and accommodating. Overall, it is a great place for a large group looking to spend some quality time together! Historic Annapolis is a beautiful town, considered one of the most desirable locations to visit in the United States. Home to the United States Naval Academy, Annapolis is rich in history and tradition. Tour historic Annapolis and learn about how people lived in 1776, or enjoy the Chesapeake Bay. The Chesapeake Bay offers opportunities for boating, swimming, skiing, wake boarding, fishing, crabbing or just catching the sunset. Dine outdoors, enjoy some freshly caught Maryland Blue Crabs, or just enjoy "Staycation" and grill at home. You will love it here. Rates vary Widely depending on Holidays and USNA activities. Summer rentals are welcomed and special rates apply. Please adhere to check in and check out instructions. Early check in or check it by written approval with a fee only.